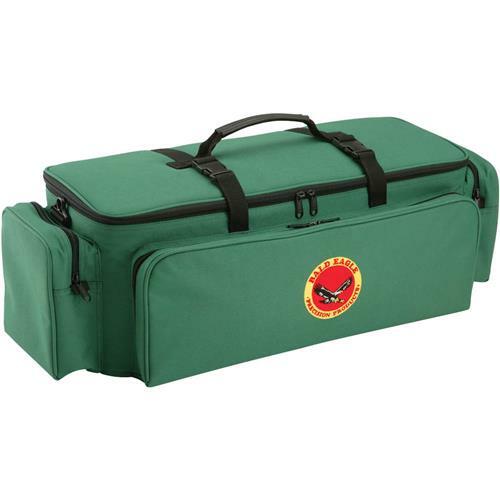 Designed to safely organize and transport shooting gear while on the range, these top grade ballistic nylon covered Range Bags also provide excellent protection for all cameras, lenses, handguns, ammo and other gear. Padded protection throughout, adjustable padded dividers, double stitching, YKK zippers, adjustable shoulder strap and reinforced top handle provides all the security you need. 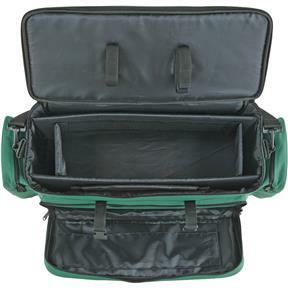 Each features a top loading 20" long main compartment, two side compartments and a front compartment as well as a back zippered pocket. The overall dimensions measure 24-1/2"L x 10-1/2"W x 8"H.
I bought the Grizzly Pro master kit of cordless 20v tools and saw it had no carrying case or bag. These bags were closeout priced for $15 so I bought them. 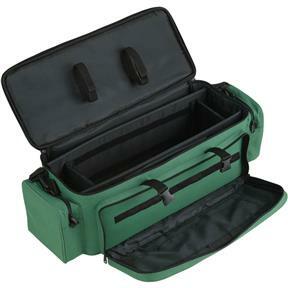 They are padded with many pockets/dividers and with two of these I can carry the complete set of tools to the job. I am completely happy with my purchase; the color matches the tools. Instead of a range bag, they can call these field bags. I don't know why they are on closeout, but I'm glad I found them at this price. I have other range bags, I needed one a little wider (20"), this one works very well for my needs. The additional zippered pockets come in handy. It appears well made.